Derived from unfermented tea leaves, green tea is an ancient Chinese drink with a history that dates back approximately 4,000 years. According to Dr. Stephen Hsu, a molecular biologist at the Medical College of Georgia, green tea contains polyphenols that help slow down the aging process, protect against sun damage and help flush your skin of free radicals. Washing with green tea provides an inexpensive way to rejuvenate and improve the overall condition of your skin. 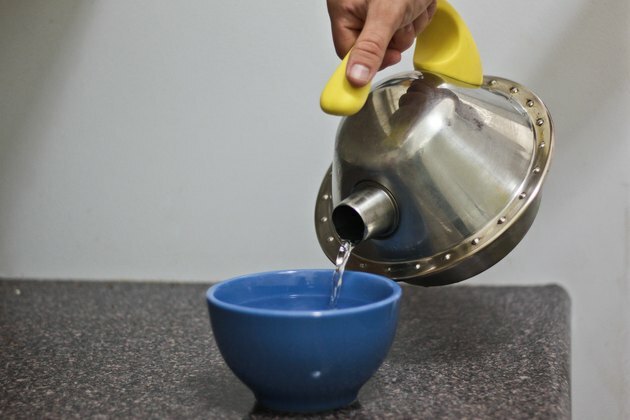 Pour 1/2 cup of distilled water into a teakettle. Place the teakettle on the stovetop and bring the water to a rolling boil. 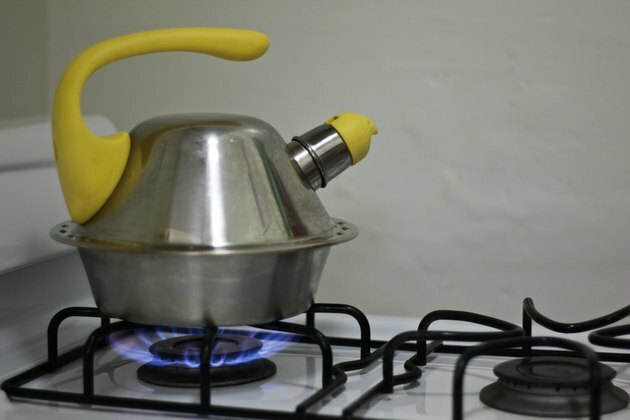 Remove the teakettle from the stove and pour the water into a small bowl. 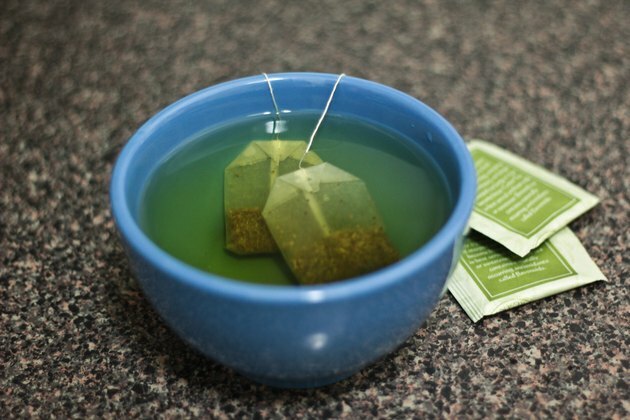 Add two green teabags to the hot water in the bowl. Allow the green teabags to steep as the water cools. 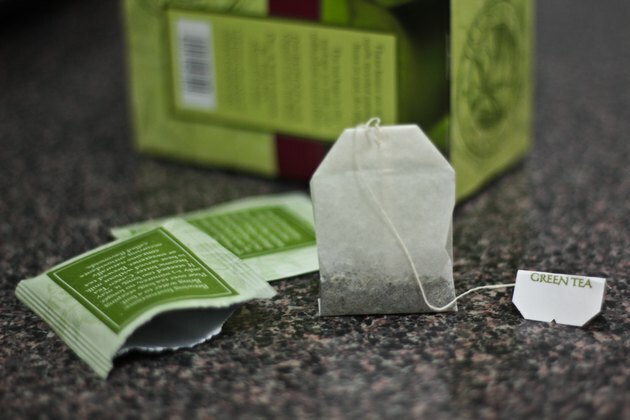 Remove the teabags from the hot water once it is cool to the touch -- usually about 15 minutes. Add 3 tablespoons of granulated sugar to the cooled green tea in the bowl. Stir the sugar and tea to combine. The sugar will act as an exfoliant, sloughing off dead cells as the green tea cleanses your skin. Saturate a clean washcloth with the green tea solution. Gently massage your skin with the washcloth. Rinse your skin with cool water after cleansing, removing all traces of the green tea and sugar. Repeat the process once a week. Green tea also works well as a face toner. Wash your skin with your usual cleanser and rinse. Follow the cleansing with a splash of steeped and cooled green tea. Try the green tea and sugar exfoliating cleanser on your body during a bath to smooth your skin. Do not wash with the green tea exfoliant more than once a week. Exfoliation can cause reddening and irritation if it is done too often. Never apply hot green tea to your skin. The hot liquid can cause severe burning. 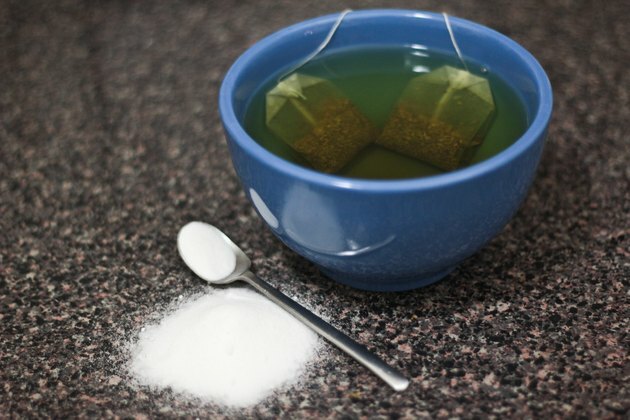 Discard any remaining green tea and sugar left in the bowl; do not save and reuse. Do not use tap water. Many city taps contain chlorine, which damages the skin. How do I Make Sweet Tea With Lipton Tea Bags?